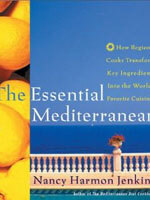 In this book, I wanted to look at a selection of primary resources for Mediterranean cooking—everything from sea salt to sheep’s milk cheeses, from pasta to sweet red peppers—in order to understand not just what makes each of these great but also how cooks throughout the Mediterranean put these resources to the finest uses imaginable. The book is a series of essays with a little anthropology, a little culinary history, and a boatload of local color, paired with recipes that show how Mediterranean cooks use each of the ingredients described. Jenkins writes her way into the heart of the region, its history, its food, its people with a level of prose and insight rarely encountered in food writing. But she’s also a wonderful cook. So these chapters are followed by two appendices that explain basic technique and food sources, because The Essential Mediterranean is also a cook’s book.